Consider today a precursor to my long promised Morphy Richards’ bread maker review to be published tomorrow. I’ve missed many of my favourite blog events lately. To my joy, this month’s Fresh From the Oven hosted by Michelle at Utterly Scrummy Food for Families was for a favourite savoury bread and I already had the required loaf sitting in front of me! For some reason, gluten free bread is invisible to my husband and Ted. Happily meaning I get to eat all of it by myself. 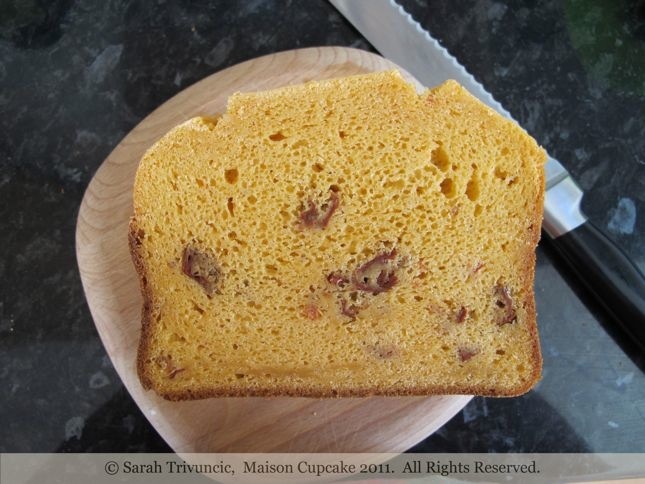 It keeps for up to a week in the fridge and tastes fantastic refreshed in the toaster then slathered with butter. Here follows, therefore, a bread maker recipe. I’ve no idea how this would work without said bread maker or in other models so you’ll have to experiment and let me know! Sun-dried tomato antipasti is required although I soaked 50g dried ones in olive oil for 6 hours which worked fine. This method is based on the Morphy Richards’ premium bread maker, quantities of ingredients and order of mixing may vary for other manufacturers. Add all the ingredients to the baking tin in the order shown. Select gluten free programme, select size of loaf, select “toastedness” level for crust, select advance cooking time if desired, select “start” and wait however long – 2hrs 35 mins in this case. Bingo! So glad you have the brad machine sussed. Looks good. Do I spy your JO bread knife there? Yep, those are Jamie knives… which are familiar friends in various posts now! i’m not a fan of gluten free bread either but this does look rather yummy! That does indeed look yummy- and talking of Jamie Oliver and his stuff, we’ve just been to the ‘Foodies Festival’ where Jamie @ Home had a stall and I coveted every single item on sale. I had to dragged away kicking and screaming otherwise I’d have been several hundred pounds poorer…. I consoled myself by spending a small fortune at a nearby chocolate stand instead! It worked! 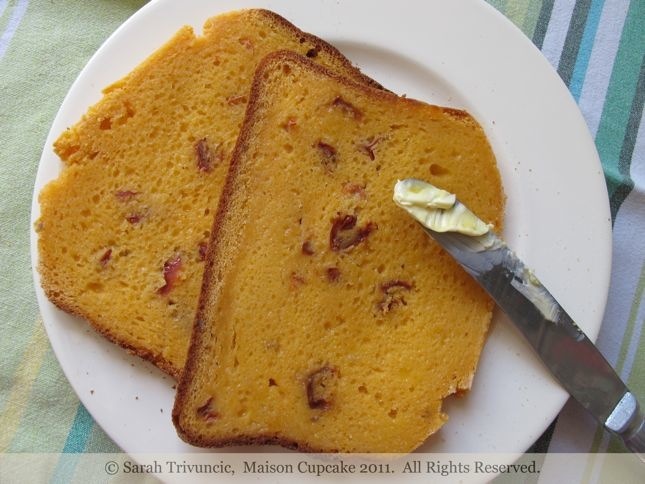 Your bread looks delicious and I am a fan of sun dried tomatoes:) Love the sound of it heated in the toaster and slathered with butter – YUM! Yes possibly I offset the health benefits by overdoing the butter and mayonnaise with this type of bread….